Mother has been a little quiet lately. 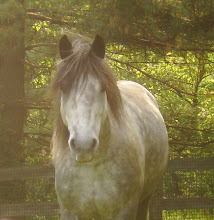 One of her favorite mares from our old barn passed away this week. You may remember I was jealous that Mother would ride the Big Ruby, but that doesn't mean I wanted anything bad to happen to her. She and another mare died unexpectedly midweek. Both were young... I believe Ruby was only six. The doctors are still trying to find out what caused this, I only know Mother has been very sad, has hugged me lots, and I've been getting lots more cookies. It's the only good that has come of this. Poor Ruby. Goodbye, my friend.